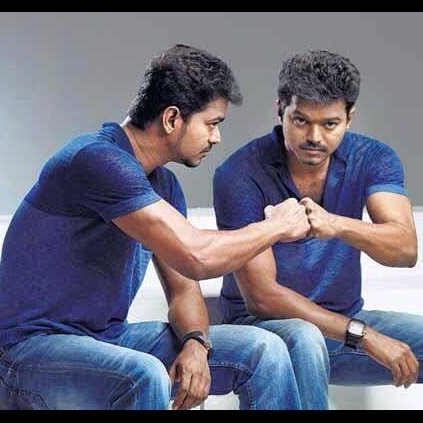 Vijay to sport two get ups for Vijay 60! THE MYSTERY BEHIND VIJAY’S CHARACTER IN VIJAY 60! Looks like the team of Vijay 60 has wrapped up the ongoing schedule which was taking place in Chennai. And as informed earlier, the shoot will be resumed by the 3rd of June in Hyderabad where portions involving the antagonist Jagapathi Babu are expected to be shot. The film is a ‘pakka’ village subject based out of Tirunelveli. It is also rumored to be on the lines of famous MGR starrer Enga Veetu Pillai. Vijay was recently spotted with a wig wearing fancy colorful attire. It is speculated that Vijay plays a dual role in the film, one with a wig and one without, adding more reasons to make us believe the film to be a remake of Enga Veetu Pillai. But no one still has an authentic confirmation saying Vijay 60 is a remake. Breaking: Jayam Ravi turns a Thondan for Samuthirakani? It’s Mohini after Nayaki for Trisha! People looking for online information on Ilayathalapathy, Vijay, Vijay 60 will find this news story useful.